This is what happens when I put off writing reviews. 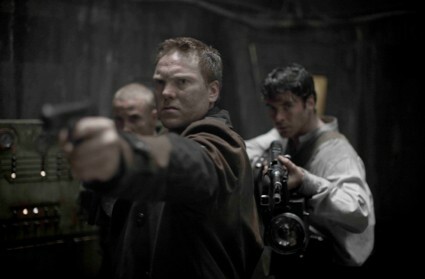 It took a while to remember the first scene in War of the Dead when Nazi officials are chatteling hostage soldiers to a bunker somewhere along the Finland-Russia border. They resist but when the chemical starts working, their eyes turn white. Chilling scene. Too bad the movie goes to pot after that. Cue Andrew Tiernan, plays soldier Martin Stone, with a permanent Clint Eastwood-esque scowl to convince the audience that he’s American. Along with a troop of Finnish soldiers, he’s on a mission to destroy said bunker. But when the night falls on this strange wooded area, Nazi zombies fly out of the trees, this ridiculously violent entrance fulfilling the “of the dead” part of the title. I also got the feeling of Schadenfreude in knowing that the Finns actually sided with the Germans during the Second World War. That explains what the cute Finnish soldier and his Russian counterpart didn’t get along in this movie.